In my last post I criticized those who overemphasize the size of a fleet as a measure of its operational effectiveness, using the historical example of the Royal Navy’s fleet modernization efforts prior to the First World War. I did not offer any alternate criteria by which to judge what an optimally sized U.S. Navy would look like. With discussions of what insights turn-of-the-century theorists such as Alfred Thayer Mahan and Julian Corbett would have on modern maritime strategy so popular right now, however, I thought there might be value to apply their models of sea power to evaluate the composition of today’s U.S. Navy. Critics of what they perceive as a too-small fleet claim that quantity is important because “presence” is necessary for command of the sea. On its face this is logical, as without enough combat power at the right spot and right time, victory is impossible. Having more ships makes it theoretically possible to concentrate a larger force at the decisive point, as well as providing more resources in more places to deter against the enemy, wherever they may be. The only restriction in a navy’s ability to provide presence is the amount of resources that a state has at its disposal. Mahan was opposed to any notion of presence itself providing any particular utility, expressing a preference for offensive fleet action, even when that end was accomplished by a fleet inferior in total size to that of its foes. His optimal navy was “equal in number and superior in efficiency” to its enemies at the decisive point within “a limited field of action,” not necessarily everywhere. It protected national interests “by offensive action against the fleet, in which it sees their real enemy and its own principal objective.” Mahan would have not approved of an emphasis on presence as an objective, for his description of the undesirable alternative to his above strategy was one which requires the “superior numbers” needed to provide “superiority everywhere to the force of the enemy actually opposed, as the latter may be unexpectedly reinforced.” Trying to outnumber the enemy everywhere at sea is an impossible end state in any situation in which a pair of opponents have remotely comparable resources upon which to draw. Corbett’s view of sea power is more compatible with the notion that presence is important. Corbett felt that what he called “Command of the Sea” was “normally in dispute” and that the most common state in maritime conflict was that of “an uncommanded sea.” In that context, presence in terms of more ships means that a navy can employ its forces in more places, with command thus achieved. It would be easier to achieve this state of command through presence in asymmetrical situations in which the smaller force is overmatched both in terms of quantity and quality. By having more ships (assuming they effectively employed them), a navy would theoretically have a better chance to locate the enemy on favorable terms. Nelson could sail across the Atlantic (and back again) and around the Mediterranean without finding the French fleet because his “sensors” were limited to the visual range of his fleet. The conflict between the German and British navies during the First World War was largely one in which the two fleets were unable to achieve their tactical objectives because they could not find each other (at least under tactically favorable circumstances). In a more modern example, the American victory at Midway was made possible by SIGINT. Because the US Navy knew that the Japanese intended to attack Midway, its fleet was placed in a position where they were more likely to find the Japanese first (even then however, each fleet was limited in their ability to locate the enemy to the range of their aircraft). The debate over presence revolves around strategy and objectives, and whether the size and composition of a fleet matches up with those objectives. If the U.S. maritime objective is the ability to operate at sea in any contested theater, then having a sensor-enabled battle force in which surveillance assets make decisive action possible before the enemy can act is more important than surface presence in terms of many ships. Conversely, if the most important objective is to provide maritime security against illicit actors such as pirates or drug smugglers, then presence is more important. As the linked post above from Galrahn notes, a UAV can enable kinetic offensive operations from another platform located far away, but it cannot board a suspect vessel and detain the crew. The debate between the advocates of presence and a high-end battle force is actually one over the relative importance of the Maritime Security and Sea Control missions, and the resources devoted to each at the expense of the other. Unfortunately, without a crystal ball, there is not a straightforward answer as to which is the more necessary one for the US Navy to conduct. A well written article, with good points regarding the difference between a fleet geared for presence and one geared for a high-end battle. The primary problem with the current structure of the Navy is that we are dwindling to a fleet that can only conduct a high-end battle in open ocean, while still demanding that we maintain presence ubiquitously. All one has to do is look at the presence requirements of the COCOMs (e.g. CSG 1.75 presence for 5th Flt, or BDM 1.0 for EMED), which have increased over recent years while numbers have dwindled. Additionally, this high end battle force, geared for blue water conflict, is not geared to fight the actual naval combat for which we must prepare i.e. China and Iran, which will, by necessity, occur closer in to shore. The first issue can be addressed in one of a few ways. 1. The administrative commands like USFFC say “No” to requests for forces from operational commands like CENTCOM & PACOM, in order to adequately prepare the units in the warfare areas for which they are designed or for non-warfare areas in which they are being utilized, to include time for upkeep and maintenance. 2. Congress can authorize more ships to fill the growing demand for presence, and also allow for adequate time for training and maintenance of the crews and ships already in service. 3. Do neither, but rather extend deployments, as well as curtail maintenance and training in order to meet demand for presence, but still make do with a shrinking surface force. This choice, of course, just kicks the can down the road, degrades both ships and sailors, and imposes a much higher future cost if the presence requirements are maintained. Sadly, we have picked door number 3. The second main problem with the current structure of the Navy is that we are not built to fight the possible enemies for whom we must prepare. A high-end battle force “which is enabled in its ability to project combat power over a larger area through technology” can be negated by circumstances such as geography and enemy defenses. As has been noted, it is unlikely that in a theoretical naval engagement with China, the CSGs would be used inside the first island chain, given that they are considered too valuable to lose. As was written above, “War at sea often revolves around two factors: the ability to locate the enemy, and the ability to employ decisive force against the enemy first.” Given that the CSGs are easily located by these threats, it would seem logical that a larger number of smaller ships, which by their smaller size and EM signature would be harder to find, carrying missiles that allow for an asymmetric attack capability would be a good idea. Or just build a lot more submarines, which could accomplish the same thing. The downside, of course, being that large numbers of the class of submarines that we currently have and are building are prohibitively expensive. The original concept behind the LCS was a good one, and could have fulfilled this concept of a smaller combatant which could actually conduct combat operations close to shore. However, our buffoonery has screwed that away. As was written in the Department of Operational Test & Evaluation’s report on the LCS, “LCS is not expected to be survivable in a hostile combat environment.” Now, it is not a given that any individual small combatant should be expected to survive in a hostile combat environment, but there should at least be a chance that it would. The reason the Royal Navy’s modernization efforts prior to the first world war were successful is that they chose to relinquish many of their missions to concentrate on what they saw as the primary threat. Additionally, they created a fleet that was designed to deal with that threat. We have done neither. Regarding your first issue/problem…the Navy sponsored a CNA study a few years ago to define the “Tipping Point” at which maritime dominance would be lost (both in terms of how many ships and where they are deployed around the world, http://www.cna.org/sites/default/files/research/The%20Navy%20at%20a%20Tipping%20Point%20D0022262.A3.pdf). Regardless of whether one agrees with the findings (and I thought the historical comparisons were shallow), it is a useful way of laying out the costs and tradeoffs necessitated by the inability to be everywhere at once. As to the second issue/problem…there are certainly valid new ideas as to bring levels of combat power and netted sensors to the fight instead of just keeping the old battle group structure (like this new Wayne Hughes piece, http://www.informationdissemination.net/2012/06/is-there-connection-between-your.html). His proposed flotilla would seem to work a lot like what the Chinese seem to want to do with their Houbei’s…lots of stealthy missile platforms integrated into a wide-ranging C2 and sensor network. The real question for task force organization like this is whether it matches up with what the battle group brings to the fight in terms of combat power measured by sorties and ordnance. Without a recent sea fight, its hard to truly measure whether the CSG’s survivability (or lack thereof) outweighs the combat capability they bring. I think James Holmes puts it best. I think that many of us have been a little misled by the way that Alfred Thayer Mahan’s work has been taught to us. Usually, we listen to some lectures, we read the Chapter in Makers of Modern Strategy, and we probably read the Introduction of “The Influence.” However, Mahan’s writing is voluminous and much more nuanced than most instructors give him credit for. We’re taught that all he cared about were battleships, colonies, and never dividing the fleet. However, he wrote about much more. When we consider his intended audience (the US Navy that was a third string player at best) as opposed to Corbett’s intended audience (the global hegemonic naval power) it shouldn’t surprise us that they sound different. Mahan himself, however, believed that his writing laid a foundation from which students, scholars and officers could then read Corbett. First you have to become the worlds dominant naval force (how to do that was mostly what Mahan wrote about) and then you have to figure out what to do with it (which is what Corbett wrote about). There are many who have suggested that Mahan didn’t believe in presence operations. They frequently quote his disdain for the globally distributed but small squadrons of the 19th century USN and the “police duty” they were assigned. 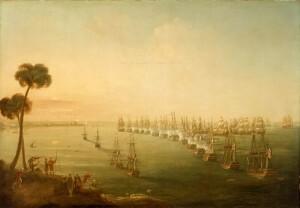 However, his dislike of those squadrons wasn’t necessarily because he thought their mission was worthless (after all, according to Mahan the very purpose of a Navy is to protect commerce and a nation’s economic interests) but because he felt that it was a mission that could only be resourced once a powerful Battle Fleet had been established. With a Battle Fleet established to provide the backbone and foundation of a Great Power Navy, then cruisers and scouts could be constructed and sent out across the world’s oceans to protect commerce. He wrote about it an article about the dispositions of Navies in Harpers Magazine. Our problem today may be that while we have had the world’s most powerful Battle Fleet for decades (arguably, we have 11 of the worlds most powerful Battle Fleets with each CSG) we continue to build the elements of that foundation over and over again. Instead we should be focusing on the other elements that Mahan writes about being necessarily once the Battle Fleet is constructed. Mahan advocated a balanced fleet, which includes cruisers, scouts, and smaller warships as well as the concentrated battleships of the Battle Fleet. As CAPT Vic Addison once wrote in Proceedings, we need to stop using “The Carrier Strike Group” as the answer to every single question. It isn’t, and Mahan would have agreed.